It seems faintly ludicrous in many respects that the future of a player who claimed his 15th and 16th goals of the campaign, and 100th and 101st at the Etihad Stadium, on an afternoon when Manchester City chalked up a 17th successive Premier League win, could be the subject of so much debate. For all the talk of Sergio Aguero being disillusioned under Pep Guardiola, the Argentina striker remains one of football's most reliable goal machines, and if the likely arrival of Alexis Sanchez from Arsenal does bring his future to a head, the City manager was adamant he will not be the one to determine it. 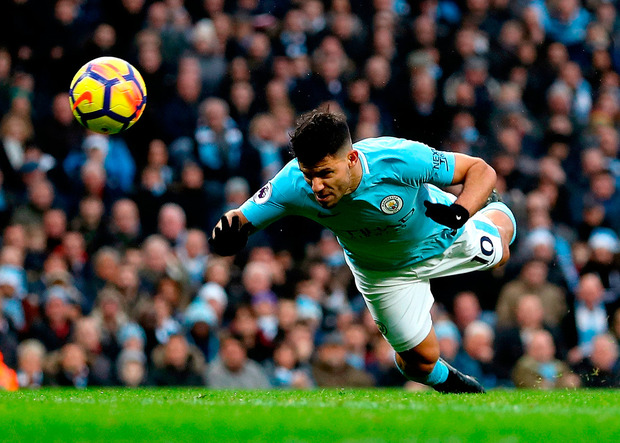 "I respect Sergio a lot, all he has done, what he does, what he will do in the future, he's a legend," Guardiola said when asked about the latest reports that Aguero could leave next summer, frustrated at not starting every game. "He will decide absolutely everything about his life, and his future, and I am delighted with him. I am so happy to have him here." Aguero has scored as many goals this season as Bournemouth have managed as a team in the league, which gives you some insight into the scale of the challenge Eddie Howe's side faced. In truth, they did not lay so much as a glove on City, and this despite the runaway league leaders barely getting out of third gear and appearing to hold plenty back in anticipation of a hectic festive period. As much as Aguero dominated the post-match discussion, though, he was not the best player on show. That was Raheem Sterling, who claimed his 16th goal of an incredible campaign and an assist and, by the end, had Guardiola salivating at the progress the England forward has made. Only a week ago Sterling was the subject of an appalling racist attack outside City's training ground but he shook off that incident to score twice against Spurs and was omnipresent again here. And they said he lacked mental toughness? "With, without the ball, he is so aggressive, so intense," Guardiola said of the former Liverpool attacker. "What I like the most is how clear he is becoming as a football player. He knows exactly when he has to dribble and when he has to pass the ball. Before, he always wanted to dribble and that was a mistake. He's loved in the dressing room. "The most difficult thing at that age is to maintain that level, every single game, always 7, 8, 7, 8 [out of 10], and he is doing that." It is what City do out of possession as much as in it that separates this team and it was there for all to see for the first goal. City do not just disorganise opposition defences with their passing and movement; their pressing routinely unbalances sides and enables them to create space to exploit. Watch the lead-up to Aguero heading home and that is abundantly clear. Howe will argue the goal was entirely avoidable and it would have been had Asmir Begovic not tried to play his way out of trouble but it still offered a vivid snapshot of the success of City's strategy of harassing and hounding high up the field. David Silva pressed Nathan Ake, who squared the ball for fellow defender Steve Cook, who, in turn, was pressed by Leroy Sane inside his own penalty area and left with little alternative but to pass back to Begovic. The Bournemouth goalkeeper could have cleared his line but the point is City did not give him much time to think and he instead attempted an aimless chipped pass back into danger that was intercepted by Fabian Delph, quicker to react than Jordon Ibe. Delph found Silva, who attempted a quick pass but when the ball bounced back to him, he laid it off for Fernandinho. 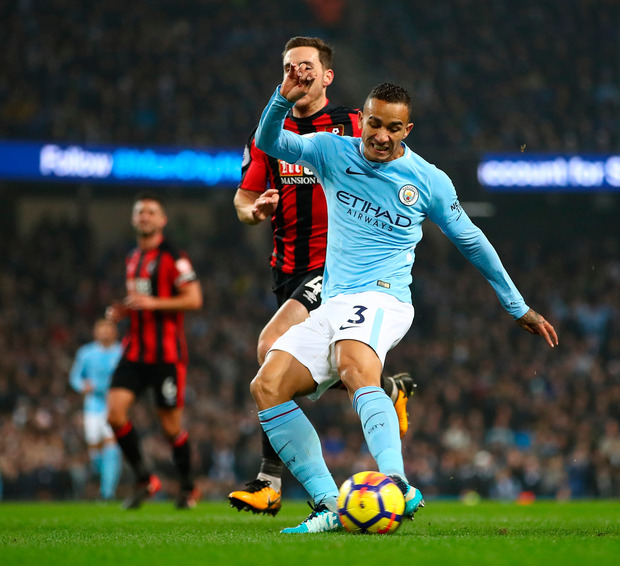 By now, Bournemouth's cohesion had been broken and Fernandinho, spotting Aguero in acres of space behind Jack Simpson, clipped a first time left-foot cross into the path of the Argentine, who stooped to head home. Bournemouth were hell bent on leaving as little space as possible for City to exploit but that killed any attacking ambition and when Sterling scored the second the game became increasingly lopsided. From the right byline, Kyle Walker played the ball inside to Silva who drilled a pass into Aguero. Spotting Sterling off his left shoulder, braced to make a dart for it, Aguero clipped a lovely first time pass into the space behind Bournemouth's defence. Sterling timed his run perfectly to race on to the ball and dispatch a cool, low finish past Begovic. Howe is renowned as an open, attacking coach but admitted he had employed a more pragmatic approach on this occasion, albeit unsuccessfully. "Games against Manchester City are one-offs really," he said. "They're a very difficult team to play against and you've got to get the balance between how brave you're going to be with the ball and with your press. Get it wrong and they're going to expose that. "We tried to stay in the game as long as we could. The second goal was a killer." 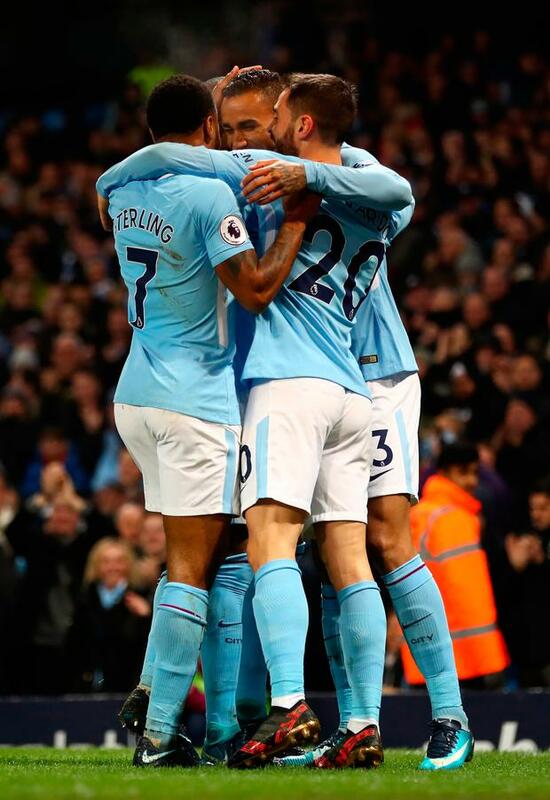 Two became three when substitute Bernardo Silva swung in a cross and Aguero used the pace of the ball to steer home a header, City's 100th in the league in 2017. The 1982 Liverpool team that featured attacking talents including Kenny Dalglish, Ian Rush and David Johnson was the last top-flight team to reach a century of league goals in a calendar year. Danilo started and finished the fourth goal. Winning back the ball, he found Silva who passed to Sterling ahead of him. Sterling glided forwards with the Bournemouth defence retreating and then played a timely pass into Danilo who drilled home left-footed. Perhaps we should stop asking who can stop City and start taking bets on how quickly they can wrap up the title. James Ducker Pep Guardiola wants his Manchester City players to channel the pain of their dramatic Champions League exit during the Premier League title run-in - in the hope it inspires rather than derails their bid.